For the rapper previously known as Kitty Pryde, see Kitty (rapper). Katherine Anne "Kitty" Pryde is a fictional superhero appearing in American comic books published by Marvel Comics, commonly in association with the X-Men. The character first appeared in Uncanny X-Men #129 (January 1980) and was co-created by writer-artist John Byrne and Chris Claremont. A mutant, Pryde possesses a "phasing" ability that allows her, as well as objects or people she is in contact with, to become intangible. This power also disrupts any electrical field she passes through, and lets her simulate levitation. The youngest person to join the X-Men, she was first portrayed as a "kid sister" to many older members of the X-Men, filling the role of literary foil to the more established characters. During this time she occasionally uses the codenames Sprite and Ariel, undergoing many costume changes for each codename until settling for her trademark black and gold costume. During the miniseries Kitty Pryde and Wolverine she is renamed Shadowcat, the alias she would be most associated with, and transitions to the more mature depiction of her subsequent appearances. She was one of the main cast of characters depicted in the original Excalibur title. After joining the Guardians of the Galaxy, she assumes her fiancé's superhero identity as the Star-Lord. In the X-Men film series, Kitty was portrayed by young actresses in cameos: Sumela Kay in X-Men (2000) and Katie Stuart in X2 (2003). Ellen Page portrayed the character in X-Men: The Last Stand (2006) and X-Men: Days of Future Past (2014). She is ranked #47 in IGN's Top 100 Comic Book Heroes. Kitty Pryde was introduced into the X-Men title as the result of an editorial dictate that the book was supposed to depict a school for mutants. Uncanny X-Men artist John Byrne named Kitty Pryde after a classmate he met in art school, Alberta College of Art and Design in Calgary in 1973. He had told Pryde he liked her name and asked for permission to use it, promising to name his first original comics character after her. Byrne drew the character to slightly resemble an adolescent Sigourney Weaver. The fictional Kitty Pryde first appeared in Uncanny X-Men #129 (January 1980), by writer Chris Claremont and artist Byrne, as a highly intelligent 13-year-old girl. Claremont said several elements of the character's personality were derived from those of X-Men editor Louise Simonson's daughter, Julie. Claremont and Byrne made the new character a full-fledged X-Man in issue #139, where she was codenamed "Sprite". She was the main character in issues #141–142, the "Days of Future Past" storyline, where she is possessed by her older self, whose consciousness time travels to the past to prevent a mass extermination of mutants. The six-issue miniseries Kitty Pryde and Wolverine (1984–1985), written by Claremont, is a coming-of-age storyline in which she matures from a girl to a young woman, adopting the new name "Shadowcat". In the late '80s, she joined the British-based super team, Excalibur, where she remained for roughly ten years before coming back to the X-Men. In the early 2000s, she disappeared from the spotlight after semi-retiring from superhero work. She was featured in the 2002 mini-series Mekanix and came back to the main X-Men books in 2004 under the pen of Joss Whedon in Astonishing X-Men. She remained a part of the X-Men books until 2008 when she left again for roughly 2 years. After coming back, she was featured in Jason Aaron's Wolverine and the X-Men and Brian Michael Bendis' All-New X-Men books. In early 2015, she joined the Guardians of the Galaxy. After the Secret Wars event, she adopted her new alias, Star-Lord (first believed to be Star-Lady). Shadowcat's popularity had a profound effect on the real-life Kitty Pryde: the latter became so overwhelmed by attention from Shadowcat fans, she abbreviated her name to K.D. Pryde to avoid association with her fictional counterpart. She has since stated she has mixed feelings about her fame, saying she values Byrne's comics for their entertainment and artistic value, but wishes more people would appreciate her as more than just Shadowcat's namesake. Katherine Anne "Kitty" Pryde was born in Deerfield, Illinois, to Carmen and Theresa Pryde. She is Jewish, and her paternal grandfather, Samuel Prydeman, was held in a Nazi concentration camp during World War II. Kitty started to have headaches at age thirteen, signaling the emergence of her mutant powers. She was approached by both the X-Men's Charles Xavier and the Hellfire Club's White Queen, Emma Frost, both of whom hoped to recruit her for their respective causes. Kitty was unnerved by Frost, observing that the White Queen looked at her as if she were "something good to eat." She got along better with Xavier and the three X-Men who escorted him, quickly becoming friends with Ororo Munroe. Ororo told Kitty who she really was and about the X-Men, which made the teenager even more enthusiastic about attending Xavier's school. Their conversation was cut short when they (along with Wolverine and Colossus) were attacked by armored mercenaries in the employ of Frost and the Hellfire Club. The X-Men defeated their assailants, but were subdued by the White Queen's telepathic powers immediately after. In the confusion, Kitty was separated from the X-Men, and not captured along with them. She managed to contact Cyclops, Phoenix, and Nightcrawler. With the help of Dazzler and Pryde, those X-Men rescued their teammates from the Hellfire Club. The White Queen appeared to perish in the battle, which meant she was no longer competing with Xavier for the approval of Kitty's parents. Kitty's parents had not heard from her in more than a day, because during that time she was first being pursued by the Hellfire Club's men and then working with the X-Men to save their friends. All they knew was Kitty had left with Xavier's "students" to get a soda, there had been reports that the soda shop had been blown up, and Kitty had been missing since. Therefore, they were angry at Xavier when he finally returned with Kitty in tow. At first, it seemed like there was no chance of Kitty being allowed to attend the school and join the X-Men. Phoenix then used her considerable telepathic power to erase the memories of Kitty's parents and plant false ones, resulting in a complete shift in their attitude towards Xavier. Kitty was then allowed to enroll at Xavier's school with her parents' blessing, becoming the youngest member of the team. Kitty joined the X-Men, and assumed the costumed identity of Sprite. Early in her career as an X-Man, Kitty's adult self from an alternate future took possession of her body in the present to help X-Men thwart the assassination of Senator Robert Kelly by the second Brotherhood of Evil Mutants. Kitty then singlehandedly defeated a N'Garai demon. Kitty also briefly attended the White Queen's Massachusetts Academy when her parents became convinced that she needed to be with students of her own age, but following a failed attempt to subdue the X-Men, Frost revoked Kitty's admission. During her teen years, Kitty fostered a number of close relationships with others at the school and in the X-Men. She developed a crush on Colossus and became close friends with his little sister Illyana Rasputin. Initially uneasy around Nightcrawler and other mutants with physical deformities, Kitty finally overcame her fears and became close friends with him. Kitty also befriended Lockheed, a highly intelligent alien resembling a dragon, who followed her home after a mission in outer space. Lockheed is extremely loyal to Kitty, and the two of them share a psychic bond. Wolverine became something of a mentor to Kitty despite his usually gruff personality. Storm came to view Kitty as the daughter she never had. Though Xavier has threatened to reassign Kitty to the New Mutants, a team of younger mutants he established in the absence of the X-Men, ever since the X-Men returned from outer space, she never ended up joining the group, who she derisively calls the "X-Babies". Kitty was later abducted by the Morlocks and nearly forced to wed Caliban. She was then abducted by the White Queen, but rescued by the New Mutants. During this time, Kitty began to date Colossus, although this did not last long. Colossus developed feelings for an alien woman named Zsaji whom he met on the Beyonder's planet in the first Secret Wars. Colossus' feelings toward Zsaji were primarily a side effect of her own unique healing abilities, which she had used on him after he became injured. Regardless, Colossus' feelings were real and he returned to Earth consumed with grief after Zsaji's death. He admitted to Kitty that he loved Zsaji, which hurt her deeply and ended the budding romantic relationship. Kitty had made good friends with a local boy from Salem Central named Doug Ramsey around this time, but her feelings for him never went as deep as his for her, and they never actually dated, though they remained close, even more so after Doug's status as a mutant was revealed and he joined the New Mutants under the codename Cypher. They remained friends until his death some time later. During the 1984–1985 Kitty Pryde and Wolverine miniseries, Kitty is possessed by a demon, the ninja Ogun. Ogun psychically bestows upon Kitty a virtual lifetime of martial arts training. Kitty was brainwashed by Ogun into becoming a ninja assassin, and was sent to attack Wolverine. Kitty is able to resist Ogun's influence with Wolverine's help, and the two form a strong teacher/student bond, which helps them in vanquishing Ogun. Kitty returns to the X-Men, no longer the innocent girl they once knew, and officially adopts the codename Shadowcat. While trying to save Rogue, Kitty was badly injured by Harpoon's energy spear during the Mutant Massacre story arc, in the massacre of the Morlocks, with the result that she lost control of her power and was stuck in an intangible state and could not regain her solidity. She was rushed to Muir Island along with other surviving casualties of the Massacre to be tended to by Moira MacTaggert. MacTaggert was able to keep Kitty's condition from deteriorating to the point where she completely lost physical substance and ceased to exist, but was not able to do any more to help her. At this time, Kitty's natural state was to be intangible. Where she once had to make a conscious effort to phase, she could now only maintain her solidity through an act of conscious will. The X-Men went to Reed Richards, Mister Fantastic of the Fantastic Four, for aid, but Richards initially refused because he was not sure he would be able to help. Among the others injured and brought to Muir Isle were Colossus and Nightcrawler, although Colossus left the United Kingdom shortly after being released from MacTaggert's care to join the rest of the X-Men on their mission to battle the Adversary. The X-Men sacrificed their lives to defeat the Adversary, the battle and their sacrifice was televised and broadcast across the world. [volume & issue needed] The X-Men were resurrected later, unknown to the world at large, but chose to keep a low profile and perpetuate the belief that they were still dead. [volume & issue needed] This strategy was enforced to more effectively fight their enemies. This meant avoiding contact with friends and family, including Kitty. Thinking the X-Men were dead, Kitty and Nightcrawler joined Rachel Summers, Captain Britain, and Meggan to form the Britain-based team Excalibur. For a brief time, Kitty studied at St. Searle's School for Girls in Britain. During her time with Excalibur, Kitty developed a crush on Professor Alistaire Stuart which went unreciprocated since Alistaire was attracted to Rachel. Later, she was romantically involved with former Black Air agent Pete Wisdom. At some point Kitty was recruited by the international law enforcement agency S.H.I.E.L.D. to repair the computer system of their flying headquarters. Kitty discovered the problem was due to Ogun's spirit having infiltrated the computer system, and with the aid of Wolverine, she managed to purge Ogun's presence. During this time, Kitty was attracted to a S.H.I.E.L.D. intern her own age, and this made her begin to doubt her relationship with Wisdom. [volume & issue needed] Soon after, she broke off their relationship. After Excalibur's dissolution, Shadowcat, Nightcrawler, and Colossus return to the X-Men. While returning, they faced a group of imposters following Cerebro, in the guise of Professor X. While tracking Mystique, she stumbles onto prophetic diaries that belonged to Irene Adler, a precognitive. During the six-month gap, Kitty visited Genosha. Whatever she experienced there is unknown (although presumably connected to her father, living on Genosha at the time), but it had a profound effect on her. She cut her hair and began to act rebelliously, also using one of Wolverine's bone claws broken off during battle as a weapon. Kitty remained with the X-Men for a while before leaving after the apparent death of Colossus. Trying to give herself a normal life, she attended the University of Chicago. During this time, her father was killed when Cassandra Nova’s Sentinels destroyed Genosha. Kitty later finds a recording of his death due to exploring footage of the attack. She is also kidnapped by William Stryker, but the X-Treme X-Men team helped her escape, and she assisted them on several missions. At the start of Joss Whedon's run on Astonishing X-Men, Kitty once again rejoins the X-Men, despite having extreme reservations about working with the former White Queen, given their history. This was the primary reason why Frost herself wanted Kitty on the team, as a sort of "safety" should Frost ever revert to type. Frost reasoned that the person who trusted her least would be most likely to spot such behavior. On one of the team's first missions, Shadowcat discovered Colossus was alive. After some initial awkwardness, Kitty and Colossus resumed dating. Kitty Pryde appeared alongside Colossus in the "Blinded by the Light" arc in X-Men. They are the two X-Men left to look after the students while the rest of the X-Men leave for Mystique's home in Mississippi to check up on Rogue, during which they are ambushed by the Marauders. Kitty and Colossus, meanwhile, attempt to protect the students from a faction of the Marauders led by Exodus. It is revealed over the course of the story that Kitty, worried of the Destiny Diaries' safety, devised a plan with Cyclops and Emma Frost to hide them and have Emma wipe the location from her mind. The location could only be revealed by a code word spoken to Kitty. The arc concludes with a battle between Iceman and Cannonball against the Marauders for the diaries, during which they are destroyed by Gambit. In the "Torn" arc, the latest incarnation of the Hellfire Club begin an assault on Xavier's School. Kitty fulfilled the role that Emma Frost envisioned, personally taking down Frost and imprisoning her, only to fall under a telepathic delusion created by Hellfire member Perfection, who claimed to be the true, unreformed Emma Frost. Under this delusion, Kitty was made to believe that she and Colossus had conceived a child, which was later taken away by the X-Men because its potential mutant abilities were supposedly dangerous. Kitty reacts in the delusion by attempting to rescue the child from a near-inescapable "box" in the depths of the school, unaware that in reality she is freeing an alien entity, Stuff, who contains the trapped consciousness of Cassandra Nova, the apparent ringleader of this new Hellfire Club. A newly awakened Cyclops revealed that the new Hellfire Club, including Perfection and Nova, are actually mental projections created by a piece of Cassandra Nova's consciousness; which became lodged in Emma's mind during the X-Men's last confrontation with her, playing on her survivor's guilt over the Genoshan massacre, and utilizing Emma's telepathy to both confound the X-Men and orchestrate her (Nova's) escape from the Stuff body. As Cyclops killed the mental projections, Emma tried to force Kitty to kill her to get rid of Nova. Undeterred, Cassandra Nova switched her focus to attempt to transfer her mind to Hisako Ichiki. It appears that Nova did not succeed, as the team was transported to S.W.O.R.D. 's air station en route to Ord's Breakworld for the "Unstoppable" arc that concludes Whedon's run on Astonishing X-Men. As the team prepares to end the confrontation with the Breakworld leader, the team splits up—with Kitty on the team appointed to stop the missile pointed at Earth. Kitty phases into the missile to disrupt its circuitry noting that it is composed of the same material as the rest of Breakworld, a material that’s difficult and exhausting for her to phase through. After phasing for a mile into the missile, Kitty finds the center only to discover it empty. The missile is fired, causing Kitty to pass out inside of it as Beast discovers too late that due to its shape, trajectory, and lack of internal circuitry, the Breakworld's weapon is not a missile, but a bullet. As the bullet hurtles toward Earth, Kitty lies unconscious within it. As the situation becomes increasingly dire, Emma establishes mental contact with Kitty, reassuring her that she will come out of this fine, though it eventually becomes clear to both that the situation will be grim. Kitty and Emma come to an understanding and reconciliation, Emma stating that she never wanted something like this to happen to her. Kitty then phases the bullet through Earth, but is trapped within. At the end of Giant-Size Astonishing X-Men, Scott Summers mentions that Doctor Strange, Reed Richards, and some "top men" tried to save her, but believe she has fused to the bullet, as it continues to hurtle through space. Whether she is alive or dead is unknown, though the X-Men consider her lost to them. As a result of these events Kitty does not appear in the X-Men crossover event X-Men: Messiah Complex, since this takes place after the events of Giant-Size Astonishing X-Men. She is briefly mentioned in the aftermath of the Messiah Complex, by Colossus, Nightcrawler, and Wolverine, as the three of them discuss "losing her." To cope with Kitty's loss, Colossus takes down a group of Russian criminals dealing in human trafficking, and gets a tattoo of the name 'Katya' on his chest. Emma begins having a recurring dream in which she hears a voice whom she believes is Kitty's trying to reach out to her. It was later confirmed by Abigail Brand that Kitty Pryde was still alive within the bullet, but because the bullet's design would harden as time went on, it would become increasingly difficult to break the bullet open. After the X-Men move to the island of Utopia, Magneto arrives on the island professing his desire to join and support the X-Men in their effort to unite the world's remaining mutants. The X-Men reluctantly let him stay, remaining wary of him despite his efforts to gain their trust. In a final bid to gain their trust, Magneto focuses his powers, attempting to divert the interstellar path of the metal bullet Kitty is trapped in and bring her home to Earth. Meanwhile, inside the bullet, Kitty is revealed to still be alive. Unbeknownst to the others, Magneto had encountered the bullet earlier while attempting to regain his powers with the High Evolutionary and surmised that Kitty was inside. Despite this and the High Evolutionary's apparent ability to retrieve the bullet and Kitty, Magneto chose to focus on regaining his powers, secretly keeping tabs on the bullet until his decision to draw it back to Earth. During her time trapped inside the bullet, Kitty keeps herself and the bullet phased to avoid collisions with any inhabited objects in its path. Magneto brings Kitty Pryde safely down to Earth, with the help of Doctor Strange, by cracking the bullet in two and levitating Kitty to the ground. When she and Colossus try to touch, it is revealed that she is trapped in her intangible form, unable to speak, and the X-Men place her in a protective chamber similar to the one used for her following the events of the Mutant Massacre. How Kitty survived her time in the bullet is unclear to the X-Men's science team, where the X-Men discover that all her bodily functions halted. An analysis by Kavita Rao hypothesizes that Kitty created an intense muscle memory to keep herself and the bullet phased and has "forgotten" how to un-phase. During a conversation with Colossus, with Emma Frost acting as the psi-conduit, Kitty picks up Emma's stray thoughts on killing the captive Sebastian Shaw, to prevent Namor from discovering she previously lied to him. While disgusted at Emma's intentions, Kitty offers a compromise. Due to her current ghost state, she is the perfect tool for making Shaw disappear. In a storyline in Uncanny X-Men, the Breakworlders make their way to Earth. During the conflict between the Breakworlder Kr'uun and the X-Men, Kitty is slain and resurrected by Kr'uun's mate in an alien ritual, which results in her powers returning to normal. Shortly thereafter, Kitty breaks up with Colossus, and decides to return with Wolverine to Westchester to open the Jean Grey School for Higher Learning. In Wolverine and the X-Men #4, she appears to be suddenly pregnant, but the pregnancy was revealed to be a Brood infestation, and it was swiftly dealt with by a team of X-Men. [volume & issue needed] Since returning to Westchester, Kitty has shared several kisses with Iceman. 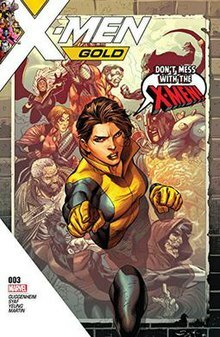 [volume & issue needed] During the events of Avengers vs. X-Men, Kitty does not take a side, but instead decides to stay at the school to work with the students. [volume & issue needed] Once Bobby returned from working with the X-Men after realizing that the Phoenix had corrupted them, he and Kitty finally decide to go on a date. After Beast brings the original five X-Men into the future to stop Cyclops in the present, Kitty volunteers to take responsibility for the temporally relocated X-Men while they work to undo this dark future. This soon puts her at odds with the rest of her team as they believed the original five should go back to their own time in order to prevent any damage to the space-time continuity. Eventually, this leads Kitty to take the decision of abandoning the school with the time-displaced X-Men and join Cyclops's X-Men at the New Xavier School. During the first few weeks at the New Xavier School, Jean Grey is abducted by the Shiar Empire to stand trial for her future self's crimes. Kitty and the time-displaced X-Men team up with the Guardians of the Galaxy and succeed in rescuing Jean from the Shiar. At the conclusion of the storyline, Kitty begins a long-distance, flirtatious relationship with Starlord, Peter Quill. In the following weeks, Kitty's relationship with Peter Quill evolves more and more as they developed stronger feelings for each other everyday. At one point, Quill gets captured during one of their dates and she has no option but to go to his rescue, despite her fear of space as a result of her being trapped on the giant space bullet. After rescuing Peter, she decides to stay in space with him. Then, Kitty convinces Peter to steal a powerful artifact called the Black Vortex from his father J'son. Soon, they find themselves being chased by J'son's assassination squad, the Slaughter Lords. In despair, they request the aid of the X-Men and the Guardians of the Galaxy to protect the Vortex. After a few of their own friends can't resist the temptation and submit to the Vortex, betray the team, and escape with the artifact; the team splits and Kitty stays in Spartax to help an orphanage. She is encased in amber after Thane (who was allied with J'son) freezes the whole planet along with the people inside it; but thanks to her phasing powers, she manages to get out of the amber. Then the Brood attacks Spartax, planning to use every encased person to lay eggs and create an army of Brood to start invading other planets and conquering them. Kitty feels the only way to stop them is by submitting to the Vortex herself as she's the only one who can resist the cosmic corruption. She reluctantly submits and becomes a being of unlimited power. After being reminded of the love between her and Peter Quill, she goes back and phases all the amber that encased Spartax, along with the Broods trying to infect the people, and sends them all to another dimension. Kitty doesn't give up the cosmic power but admits to Peter that she is afraid of it. Peter promises her that he will never abandon her no matter how much she changes. Then, Peter kneels and proposes marriage to Kitty. She, with tears in her eyes, accepts. Later when Star Lord is declared Emperor of Spartax she is told she will become the first lady of Spartax. Kitty takes on the mantle of Star Lord and joins the Guardians of the Galaxy in Peter Quill's place so he can take on his royal duties. When Hala the Accuser massacres Spartax in an attempt to make Quill pay for J'Son's actions against her people, she initially easily lays waste to the capitol and overpowers the Guardians. After the Guardians regroup and formulate a strategy to defeat her, Kitty manages to partially phase Hala into the ground so the rest of the Guardians can knock her out and separate her from her weapon. After Quill loses his title as king he and Kitty end up on a mission with the rest of the Guardians on a concentration camp prison planet owned by the Badoon after Gamora gave them information on it so they can free Angela. Once there, Kitty has a personal reaction upon seeing the prisoners and makes it her mission to liberate everyone there and defeat the captors, as it reminds her of Nazi concentration camps. After Quill gets captured and sentenced to death in an arena battle, Kitty finds and kills one of the Badoon leaders by phasing his heart out of his body. When Captain Marvel summons the Guardians to Earth to help her address Tony Stark, Kitty learns that Thanos is a prisoner on earth and tries to convince Quill to tell Gamora. When fighting starts Kitty woefully realizes that some of her former students are on Tony Stark's side instead of fighting with Captain Marvel. During the battle the Guardians' ship was destroyed, effectively stranding them on Earth. After helping the Guardians stop Thanos from leading an invasion from the Negative Zone the Guardians are given a new ship, however Kitty decides to stay on earth and ends her time with the Guardians and Quill. 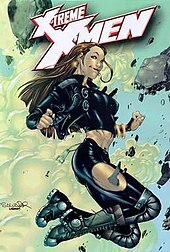 Kitty on the cover of X-Men Gold vol. 1 #3 by Marc Guggenheim, art by Ardian Syaf. Upon returning to Earth, Kitty hopes to finally regain a semblance of a normal life but ends up approached by Storm, who informs Kitty of everything the X-Men have gone through while Kitty was away. Storm announces to Kitty that she intends to step down as leader of the X-Men due to the guilt that she feels for leading the X-Men to war and offers Kitty her position. After touring X-Haven and seeing how much things have changed and how much things need to change for the better, Kitty agrees to lead the X-Men as long as Storm remains on the team. Her next act is to relocate the mansion from Limbo to Central Park, New York so the X-Men can refocus on being part of the world instead of fearing it under the belief that if the X-Men truly are to be seen as heroes, then they need to actually live in the world that they are trying to save instead of constantly worrying about their own survival. Under Kitty's new leadership, the X-Men go through some small changes in order to shed their past history and make new names for themselves, such as convincing Rachel Summers to change her code-name to Prestige and renaming the mansion as The Xavier Institute for Mutant Education and Outreach. Kitty learns first hand how hard it is to balance leading the X-Men as well as managing the mansion when there are many political factors trying to deliberately get in the way of the X-Men. She also begins to have awkward one-on-one moments with Colossus; they try to remain friends, but given their long history their interactions swiftly become complicated. Kitty's first case as field leader of the X-Men sees her and her team taking on a new Brotherhood of Evil Mutants. After discovering that an outspoken anti-mutant politician brainwashed this new Brotherhood to work for her to publicly discredit mutants, Kitty threatened to expose her if she continued exploiting mutants for her own personal gain. Kitty expressed a romantic love interest in Colossus early into her time with the X-Men. This did not sit well with Marvel Comics' editor-in-chief at the time, Jim Shooter, who disapproved of the suggestion that a nineteen-year-old boy was sleeping with a fourteen-year-old girl. Kitty had in fact directly propositioned Colossus in Uncanny X-Men #165, when they were both infected with Brood embryos and seemingly doomed to die: Kitty, aware of the taboo of their romantic relationship, made the plea that if she were older it would not be a problem, but Colossus refused—offering only a passionate kiss—saying "However, little one, you are not older". This did not stop the relationship from continuing, as the two were spotted once again passionately kissing in an apparent formalization of their romantic involvement. Shooter finally brought an end to the relationship in his Secret Wars limited series, in which Colossus developed romantic feelings for an alien woman named Zsaji while on the Beyonder's Battleworld. Zsaji was a healer whose abilities had a side effect of infatuation. For Colossus, this infatuation furthered his doubts of his feelings for Kitty due to his jealousy of her friendship with Doug Ramsey and led to a passionate, albeit brief romantic relationship with Zsaji. After Zsaji's death, Colossus found he no longer had romantic feelings for Kitty, and upon returning to Earth, he would break up with her. The two remained friends, though much cooler around each other until they were separated when Colossus was among the X-Men killed in Dallas during Fall of the Mutants. While a member of Excalibur, Kitty exploited her closeness with Colossus after he joined the Acolytes by luring him to Muir Island under the pretense of wanting to join him on Avalon. In reality, it was a ruse to allow Professor X to heal a head injury Colossus had suffered which they assumed had led to his defection. Kitty disliked betraying him, but went along with the ruse and was forgiven for her part in it. After the fall of Avalon, Colossus came to Muir Island looking for Kitty, and upon finding her with Pete Wisdom, he attacked and seriously injured Wisdom. The two talked about their past and decided to become close friends, with Colossus carefully watching over her romantic relationship with Wisdom. After Kitty and Wisdom's romantic relationship ends, she rejoins the X-Men with Colossus and Nightcrawler, and the two remain close. Kitty was not among the team when Colossus sacrificed himself to cure the Legacy Virus, but she returned to claim his ashes and spread them in his homeland. After Colossus' resurrection in Joss Whedon's run on Astonishing X-Men, the two discuss their feelings and renew their strong, close romantic relationship. During the events of Fear Itself after numerous failed attempts to stop the Norse-powered Juggernaut Cain Marko, Shadowcat goes on a mission with Magik and Colossus to Cytorrak's dimension to try to convince him to stop using Cain Marko as the avatar of the Juggernaut. Cytorrak accepts on the terms that one of them become his new avatar, which Colossus takes to prevent his sister from carrying the burden. After Colossus repels Cain's attack, Kitty dissolves her romance with Colossus, saying she needs a man who will live for her, not die for her. Since the universe reboot following Secret Wars, Colossus has joined the Pryde-led X-Men Gold team. Upon realizing continued shared attraction, Colossus stated his belief that they should only proceed if it was toward the direction of marriage. In response Kitty conceded that she needed time to think about it. After defeating Omega Red in Russia, Kitty surprises Colossus with a kiss, telling him she had said she needed time—and she had taken it. The issue ends with the two walking off together alone while Colossus tells Kitty that his home is wherever she is, their relationship renewed. In comics, Kitty and Star-Lord developed strong romantic feelings for each other. After the Avengers vs. X-Men and the relaunch called Marvel Now that followed, writer Brian Michael Bendis became the main architect behind both the X-Men and Guardians of the Galaxy franchises. His plan to join Kitty and Star-Lord would not start until a year later when he created a crossover event called "The Trial of Jean Grey" where he revisited the event of the original Phoenix Saga with the original X-Men team who he had brought into the present. Initially after breaking up with Colossus, Kitty Pryde tries to date Bobby Drake, until leaving the Jean Grey School for Cyclops's school after the Battle of the Atom. At the end of the crossover, Star-Lord gives Kitty an intergalactic phone she can use to call him whenever she wants to. Kitty, who was already interested in still seeing him, accepted the gift and kissed him on the cheek. Soon, Star-Lord's new ongoing series writer Sam Humphries took interest in the relationship and decided to expand it in his own book. He, along with Bendis and editor Mike Marts (who edited both franchises), would start developing the relationship for a year before doing another crossover event that would be completely focused on them. In Star-Lord's book, Peter and Kitty kept using the intergalactic phone to call each other and have what they called "holo-dates". The many problems in Peter Quill's life started interfering and soon he was captured by a new villain who had put a bounty on Peter's head called Mr. Knife. Kitty, who had been witness of Peter being abducted while they were on a date, rushed to Avengers Tower and stole one of Tony Stark's jets to go into space and save Peter. She infiltrated Mr. Knife's base (now revealed to be J'son, Star-Lord's father) and rescued Peter after hitting Knife in the face. Then they kissed for the first time. After spending an afternoon in Ma Savage's orphanage (one of the many orphanages Peter founded), Kitty decides to leave Earth and stay in space with Peter, and they consummate their relationship on Peter's ship. Soon the crisis of the Black Vortex started. Kitty and Peter started fighting a lot because of the Vortex; Kitty wants nothing to do with it while Peter wants to have cosmic powers to help him deal with the horrors of outer space. However, at one point, Peter has the complete freedom to submit to the Vortex and gain cosmic powers. He asks the Vortex to show him how his future would be if he submitted and he sees himself saving Spartax and gaining the approval of his father, but then he'd go back to being a womanizer and Kitty would leave him. Peter completely rejects the Vortex after this, wanting to be a better man for Kitty because he really loved her. Kitty appreciates this but submits to the Vortex anyway in order to save the galaxy. After saving all from the horrors of the Black Vortex, everyone is offered a chance to give up their new acquired cosmic powers but Kitty doesn't take it. She uses these new powers to walk in space with Peter. There, she confesses to him how afraid she was of these new powers and their influence. Peter assures her that no matter what happens or how much she changes, he would be by her side to the end because he knew the real Kitty would always be there. To prove how sure he is about his love for her, he proposes. Kitty starts crying and accepts. They dance together in space while their friends watch. Physics professor James Kakalios has attempted to use quantum mechanics to explain Kitty Pryde's "phasing" power. He has described it as an ability to control her own "macroscopic quantum wave function, increasing her tunneling probability to near 100 percent at will." Kitty is a mutant with the ability to pass through solid matter by passing her atomic particles through the spaces between the atoms of the object through which she is moving. In this way she and the object through which she is passing can temporarily merge without interacting, and each is unharmed when Shadowcat has finished passing through the object. This process is called "phasing" or quantum tunneling and it renders her almost completely intangible to physical touch. Shadowcat passes through objects at the same speed at which she is moving before she enters them. Since she is unable to breathe while inside an object, she can only continuously phase through solid objects (as when she travels underground) as long as she can hold her breath. However, contrary depictions of the duration of her phasing ability have been presented, such as when she has phased miles within an object. The use of her abilities also interferes with any electrical systems as she passes through by disrupting the flow of electrons from atom to atom, including the bio-electric systems of living bodies if she concentrates in the right way. This typically causes machines to malfunction or be destroyed as she phases through them, and can induce shock and unconsciousness in living beings. Besides her mutant powers, Kitty is a genius in the field of applied technology and computer science. She is highly talented in the design and use of computer hardware. She is a skilled pilot of piston and jet engine aircraft, and a competent pilot of certain advanced interstellar vehicles. She has previously shown a unique ability to wield the Soulsword and also be harmed by it. Since her possession by the ninja demon Ogun, she has been consistently shown to be an excellent hand-to-hand combatant, having since been endowed with a lifetime of training in the martial arts of Japanese ninja and samurai. She is a professional-level dancer in both ballet and modern dance. She speaks fluent English, Japanese, Russian, and the royal and standard languages of the alien Shi'ar and Skrull, and has moderate expertise in Gaelic, Hebrew, and German. Kitty also shares a mental/empathic connection with her pet dragon Lockheed; both she and the alien dragon can "sense" each other's presence at times and generally understand one another's thoughts and actions. Since Kitty used The Black Vortex her powers were augmented to a cosmic scale making her a god-like being. [volume & issue needed] She can phase through any material of any density and can even phase a planet out of Thane's amber which in her normal state is an extremely difficult task to simple phase herself out of the amber. She can also apparently transverse between the planes of the multiverse and is immune to the effects of space. Her appearance can be changed but her natural form appears to be rather gaseous in look. In addition to her mainstream incarnation, Kitty Pryde has been depicted in other fictional universes. Kitty Pryde appeared as Sprite in "The X-Men Adventure" episode of Spider-Man and His Amazing Friends, which guest-starred the X-Men. She was voiced by Sally Julian. She also appeared in her short-lived "Ariel" costume in the X-Men group cameo at the end of the episode "The Education of a Superhero". Kitty Pryde (voiced by Kath Soucie) was a viewpoint character in the animated television one-shot Pryde of the X-Men, as the newest member of the team. She is a new recruit of the team and is initially frightened of Nightcrawler, due to his demonic appearance. She and Nightcrawler later succeed in defeating Magneto. Once Nightcrawler seemingly dies as a result of having apparently sacrificed himself, Kitty begins to cry until discovering that he is alive and is met with positive relations by her teammates, except Wolverine. As the pilot was a failure, and the character had lost prominence in comics at the time, she was not used in the next X-Men TV series, not even in cameos. Jubilee replaced her as the young viewpoint character, and in the adaptations of stories that involved her. In the animated series X-Men: Evolution, Shadowcat is a main character, who is shown as the teenybopper of the team and who has a romantic interest in Brotherhood member Lance Alvers. Shadowcat saves Wolverine in the season one episode "Grim Reminder", where she unintentionally stows away with Nightcrawler while on the Blackbird without the knowledge that he was beginning to pilot the jet. She is also shown to have developed a close friendship with Nightcrawler, despite the fact that she at first displayed a dislike for his appearance. Besides Nightcrawler, she is shown to have formed a friendship with Rogue and Spyke. Her initial dislike of his appearance changes after he is severely wounded by Rogue, while she and the rest of the X-Men tried to recruit her. In this series, she does not have Lockheed for a pet, but she is shown preferring to sleep with a stuffed dragon instead of a teddy bear. Though she has an on-and-off interest in the delinquent mutant boy Lance Alvers, early in the series she displays interest in Cyclops. After Rogue is recruited, she serves as her support in beginning a romantic relationship with Scott and develops a friendship with her, despite their differences. When Avalanche tries to join the X-Men in the season two episode "Joyride", she tries to help him and shows additional attraction to him as she grades him and the other members of the junior team. After he informs her that some members of the group have started a joyride on the Blackbird and helps her avert catastrophe, she staunchly defends him once he is accused by Cyclops of being responsible. When Avalanche starts to leave, Shadowcat gives him a brief kiss before his departure. Their relationship continues with the two of them going to a school dance, talking on the phone and going to the mall. Despite being with the Brotherhood, Avalanche tries to protect Kitty in the fight against the Scarlet Witch. In season 3, Kitty and Lance's relationship briefly ends after the Brotherhood and Mystique blow up the X Mansion and are in part responsible for the exposure of mutants. Kitty calls Lance a "hood" after he attacks the high school and he says "he will never be good enough for her". Both look sad at these comments. In the fourth season, the X-Men try to use her powers to damage one of Apocalypse's domes and fails, instead being electrocuted briefly. In the fiftieth episode of the series, entitled "Ghost of a Chance", she comes across Danielle Moonstar once she depicts herself in a dream sequence to her. Once she wakes out of it, she tries to and successfully finds her, becoming friends with the girl after learning she had been in suspended animation for two years. Prior to this, it is discovered that her fear is phasing repeatedly into the ground and going further without any control of where she is going. Shadowcat plays a key role in the defeat of Apocalypse and asks the Brotherhood for help. They come to her aid; as Lance and Kitty resume their romantic relationship. Of the six main X-Men from the first season of the series, she is one of the four that is still a member of the team in the future Charles Xavier saw while in the mind of Apocalypse. Shadowcat was voiced by Maggie Blue O'Hara. Shadowcat appears in Wolverine and the X-Men,[vague] voiced by Danielle Judovits and was a student at the Xavier Institute before the destruction of the X-Mansion and disappearance of Professor X. When Wolverine reformed the X-Men to take down the Mutant Response Division and save the dismal future controlled by the Sentinels, Kitty was on her way to the "mutant paradise" Genosha. The X-Men came to re-recruit her and she immediately rejoined the team. Shadowcat appears as the youngest member of the team and she seems to have a crush on Iceman as she is jealous when his attention is taken by Emma Frost and is shown with a love-struck face when she lands on Bobby during a Danger Room training session, though she quickly moves away from him when Angel arrives. She seems to have formed a friendship with Tildie Soames after babysitting her in one episode. In the last episode of the series, she uses her powers to penetrate a Sentinel controlled by Magneto, of which Beast had difficulty with. Her design is inspired by the appearance of the character in the Astonishing X-Men comics, and her costume emulates the design with the appearance of the blue and yellow used on her costume. The shorts she wears are based off the appearances of the original X-Men, and her first appearance when she wore a variant of the uniform. Shadowcat appears in The Super Hero Squad Show episode "And Lo...A Pilot Shall Come". She appears alongside Colossus at the unveiling of the Great Wall that separates Super Hero City from Villainville and helping citizens into the S.H.I.E.L.D. Shelters. In the episode "Mysterious Mayhem at Mutant Academy", she uses Lockheed to chase Reptil and the hypnotized X-Men out of the girls' bathroom. Shadowcat appears in the Astonishing X-Men motion comic, voiced by Eileen Stevens and later by Laura Harris. In the film X-Men, she has a small cameo, played by Sumela Kay. She is referenced as the "girl in Illinois who can walk through walls" by Senator Kelly. She is shown in Xavier's class when Wolverine walks in; she returns for her books which she had left behind, grabs them, and phases through the door on her way out. Xavier responds with a cheerful "Bye, Kitty" while Wolverine looks on, startled. In X2, she has a brief appearance played by Katie Stuart. She is shown phasing through walls and through people to escape William Stryker's military forces during their attack on the X-Mansion. Another scene shows her falling through her bed to avoid an assault. She shares a room with Siryn; in the novelization it is stated that this is because her phasing ability gives her partial protection from Siryn's scream. When the President of the United States asks Professor Xavier how he got the files he gave him, Xavier replies that he knows a little girl who can walk through walls. In X-Men: The Last Stand, she is portrayed by Ellen Page and has a central role. She serves as a rival to Rogue for the romantic attentions of Iceman, since their close friendship and their kiss (deleted scene) make Rogue increasingly jealous and frustrated. She also joins the X-Men in the battle on Alcatraz Island, breaking off from the battle to save Leech from the Juggernaut. In the novelization of the film, it is hinted that at some point Kitty had a romantic relationship with Colossus, but that it had long since run its course, although Colossus appears to still retain feelings towards her. Ellen Page reprises her role in X-Men: Days of Future Past. Pryde is the prime facilitator because she has developed a new power. In this film she can send the consciousness of another person back into his or her body in the past. At the beginning of the film, she has been using this ability to repeatedly send Bishop four days back in time whenever the Sentinels attack, thus preventing her group from ever engaging them by having him warn the past team before they are detected. In order to prevent the Sentinels' creation, she sends Wolverine back to 1973 (chosen as the strain of sending someone else back that far would snap their mind, with Logan's healing factor the only thing that makes such a trip survivable for him), and was gravely injured when Wolverine becomes violent due to provocation from events in 1973. After the timeline was successfully altered, Kitty is seen teaching a class at the X-Mansion with Colossus. In the film's alternate release, called The Rogue Cut, Kitty's injuries from sending Wolverine back to the past result in the X-Men rescuing Rogue to take over for her. Rogue absorbs Kitty's powers and takes over, stabilizing Wolverine, and Kitty helps Magneto flee a Sentinel attack. In January 2018, it was announced that a Kitty Pryde solo movie is in development, with Tim Miller attached as the director and Brian Michael Bendis as the writer. However, in March 2019, after Disney's purchase of 21st Century Fox, Fox executive Emma Watts described The New Mutants as the final film in the X-Men series, thus ending the development of the Kitty Pride film. Kitty Pryde appears in Konami's 1992 X-Men video arcade game, as a non-playable character (NPC). In this game, she is not known as "Sprite"; instead, she plays the "damsel in distress" role as it is based on "Pryde of the X-Men". In the 2010 re-release of the game she is voiced by Mela Lee. Shadowcat is a playable character in the game X-Men II: The Fall of the Mutants. Shadowcat appears as an NPC in the X-Men Legends II: Rise of Apocalypse, voiced by Kim Mai Guest. She has special dialogue with Colossus (who she scolds for flirting with Scarlet Witch). Shadowcat appears in X-Men: The Official Game, with Kim Mai Guest reprising her role. Shadowcat is a playable character in Marvel Super Hero Squad Online, voiced by Tara Strong. In X-Men: Destiny, Gambit mentions that the U-Men had captured Kitty and extracted bits of her power. Gambit obtains a vial of a substance which temporarily lets the character fall through the roof (if the player chose the correct option). Kitty Pryde is a playable character in the Facebook game Marvel: Avengers Alliance. Kitty Pryde is a playable character in the X-Men: Days of Future Past app game. Kitty Pryde is a playable character in the online MMO Marvel Heroes, with Danielle Judovits reprising her role. Kitty Pryde appears in the X-Men/Star Trek crossover novel Planet X. In it, she is examined by Geordi La Forge, who notes the similarities between her ability and the chroniton displacement he and Ro Laren experienced in the Star Trek: The Next Generation episode "The Next Phase". Kitty Pryde has been well received as a comic book character and as a member of the X-Men. Wizard magazine put her at number #13 in 200 Greatest Comic Characters of All Time. She was the highest female comic character in the list beating rivals such as Wonder Woman, Buffy Summers, and She-Hulk. IGN ranked her as the 47th greatest comic book hero of all time stating that "as X-Men writers have often found it useful to introduce younger teen recruits to offset the experienced members of the team, Kitty Pryde set the standard when she debuted, and none have surpassed her". IGN rated Kitty Pryde #3 on its list of the Top 25 X-Men from the Past 40 Years describing her as the mutant everyman, the common girl turned superhero; IGN also stated that as her pet dragon, Lockheed, "became instantly attached to Kitty, [they] were hooked early on". Marvel.com ranked her as the tenth greatest X-Men member stating that "unquestionably, the dynamic of the X-Men shifted entirely when teenage whiz kid Kitty Pryde joined the team in the early 1980s"; Marvel.com also stated that even though Kitty has since blossomed into a young woman of considerable maturity and power, she remains the access point to the X-Men for countless readers. A later list on Marvel's website, ranking the top 50 X-Men characters, placed her in first place, citing the ease of identifying with her for the audience, and her development over the years. ^ a b c Kakalios, James (2005-10-04). The Physics of Superheroes. New York: Gotham Books/Penguin Group, Inc. ISBN 978-1-59240-146-8. Archived from the original on 2018-02-16. The author, James Kakalios, is a physics professor. Pages 254-255: "With our improved understanding of physics, we can now more accurately describe Kitty Pryde's mutant power as being able to alter her macroscopic quantum wave function, increasing her tunneling probability to near 100 percent at will." Page 255: "How, when she's is 'phasing' and immaterial, can she walk?" ^ Grant, Steven (October 22, 2008). "Permanent Damage - The 20 Most Significant Comics". Comic Book Resources. Archived from the original on 2011-06-17. ^ a b Cronin, Brian (March 16, 2006). "Comic Book Urban Legends Revealed #42". Comic Book Urban Legends Revealed. Comic Book Resources. Archived from the original on June 3, 2014. Retrieved February 4, 2010. ^ The X-Men Companion, Volume II. 1982. Fantagraphics Books, Inc.
^ Defalco, Tom (2006-05-01). Comics Creators on X-Men. Titan Books. p. 79. ISBN 978-1-84576-173-8. ^ "STAR-LADY REVEALED, "SECRET WARS" ENDS, "ALL-NEW, ALL-DIFFERENT MARVEL" BEGINS". 2015-07-14. Archived from the original on 2016-03-21. ^ Buchanan, Bruce (August 2008). "The New Mutants: From Superhero Spin-Off to Sci-Fi/Fantasy". Back Issue! (29): 64. ^ "Review of Uncanny X-Men #183". UncannyXmen.net (see "Notes"). Archived from the original on 2007-10-11. ^ G. Kendall (July 15, 2018). "X-Men: The Animated Series – Where the Heck Was Kitty Pryde?". CBR. Retrieved August 31, 2018. ^ Wolverine e os X-Men (Wolverine and the X-Men) Eps. 3, 4 - "Hindsight Pt. III, Overflow"
^ "'X-Men: Days of Future Past' Cast: Ellen Page, Anna Paquin, Shawn Ashmore Added To Roster". The Huffington Post. 2013-01-26. Archived from the original on 2013-01-29. ^ Plumb, Ali (July 31, 2013). "Exclusive: Bryan Singer Talks X-Men: Days of Future Past". Empire Magazine. Archived from the original on August 24, 2013. Retrieved August 4, 2013. ^ McNally, Victoria (July 12, 2015). "Every Secret We Learned Watching The 'X-Men: Rogue Cut'". MTV.com. Archived from the original on July 16, 2015. Retrieved July 17, 2015. ^ Trumbore, Dave (January 9, 2018). "Tim Miller Developing Solo 'Kitty Pryde' Movie at Fox". Collider. Archived from the original on January 9, 2018. Retrieved January 9, 2018. ^ "Kitty Pryde X-Men Spinoff Movie in Development With Tim Miller and Brian Michael Bendis". 2018-02-13. Archived from the original on 2018-02-16. Retrieved 2018-02-15. ^ "X-Men Spinoff: Kitty Pryde Movie in the Works From Brian Michael Bendis, Tim Miller". Archived from the original on 2018-02-15. Retrieved 2018-02-15. ^ Long, Christian (April 3, 2019). "Disney confirms X-Men team getting 'perfect sendoff,' New Mutants still on release slate". Syfy. Retrieved April 6, 2019. ^ "Wizard's top 200 characters. External link consists of a forum site summing up the top 200 characters of Wizard Magazine since the real site that contains the list is broken". Wizard magazine. Archived from the original on June 8, 2011. Retrieved May 19, 2011. ^ "Kitty Pryde is number 47". IGN. Archived from the original on May 8, 2011. Retrieved May 19, 2011. ^ "Top 25 X-Men". IGN. Archived from the original on July 13, 2011. Retrieved May 19, 2011. ^ "Take 10: Greatest X-Men". Archived from the original on August 8, 2011. Retrieved May 19, 2011. ^ "The 50 Greatest X-Men of all time Part 5". Archived from the original on 2014-02-01. Wikimedia Commons has media related to Cosplay of Kitty Pryde. This page was last edited on 15 April 2019, at 23:40 (UTC).